After a meeting with a wedding photographer on Tuesday, we decided to celebrate with dinner out at Rock Lobster Food Co.
Rock Lobster has a very Canadiana ice fishing hut feel to it: natural wood, candle light and antique prints and maps. We sat at a high top table that was very cosy and intimate. The one thing I disliked about the ambiance of the restaurant was the fact that the bar had a television. It seems like it is impossible to go to a restaurant that doesn’t have a television. The television really took away from the vibe and atmosphere that the restaurant was going for: Canadiana hipster chic. I started out with the Rock Lobster Caesar. The Rock Lobster Caesar with Ketel One vodka, steak spice, Clamato, Tabasco sauce, Worcestershire sauce, and a Nova Scotia lobster tail. This was a good Caesar but its focus was more on the decorations and presentation rather than the actual spice and flavour. I found the cocktail lacked the thickness and heat that I love. The lobster tail was a visually awesome touch but it was frozen to keep the cocktail cold. This meant you couldn’t really enjoy the lobster tail making it purely a garnish, and lobster should never be reduced to a garnish. GC ordered the Rock Lobster Roll. The Rock Lobster Roll with Yukon chips and McClure’s dill pickle. The lobster roll was creamy and slightly lemony. I think there could have been a touch more mayonnaise to the lobster salad and fresh herbs like dill, chives or even celery, to add a bit of fresh crunch to the salad. The bun was toasted and buttery, and gave the perfect bread to lobster salad ratio. This is not the best lobster roll in the city (that still belongs to the Buster’s Sea Cove food truck) but it’s pretty tasty. The pickle was not great and that was a huge disappointment since they made a point of specifying on the menu what brand of pickle it was. The pickle did not have enough crunch or vinegar to it. I ordered the Lobster Mac ‘N Cheese. 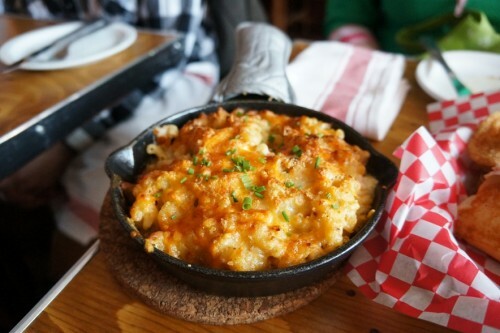 Lobster Mac ‘N Cheese with fresh lobster, aged Canadian Cheddar and panko crust. I don’t know why I ordered the macaroni and cheese. I am a firm believer that lobster is wasted in macaroni and cheese. It’s buttery, flakiness is lost in the thick, creaminess of the pasta. The chunks of lobster were too small, and insignificantly dotted the pasta. The actual macaroni and cheese was good: thick, creamy and I loved the panko crust. The macaroni and cheese did not have the nice tang I like from a touch of mustard but that’s standard in restaurant macaroni and cheeses. The food was good, but not to the quality you want your seafood to be. Seafood is something of an indulgence and you want the best quality. Unfortunately, Rock Lobster has left me wanting a better seafood experience. I will have to get myself some buck-a-shuck oysters soon and save up for a seafood tower at La Societé! This entry was posted in Tasting, Uncategorized and tagged cocktails, macaroni and cheese, sandwiches, seafood, Toronto by Audrey. Bookmark the permalink.